When I was four years old, I was visited by a man, a woman and a young red-headed boy at my orphanage. I knew that they were interested in checking me out, but I didn't imagine at the time that they would end up becoming my new family. During their times with me, they would bring a bear with them. A teddy bear, who they called Mishka, which means "little bear" in Russian. 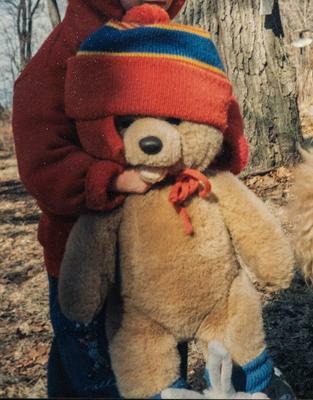 I was immediately attached to that big bear (who was pretty big compared to my little young self at the time), and I think is was evident to my new family that I loved their gift to me. And that was true then, and it continues to be true to this day. Now that I am 28 years old, I don't really play with him like I used to, but he still continues to have the honor of being kept safe and sound in my room. We used to do everything together. I loved playing by myself, but Mishka was always there with me, whether it was chasing geese around or falling asleep at a picnic, or even being by the beach. He was played with a bit harder than I probably should have. At one point, his eyeball popped out, and another time (I believe) his head came off, and another time his nose material peeled off, revealing the harder, more detailed nose piece underneath. 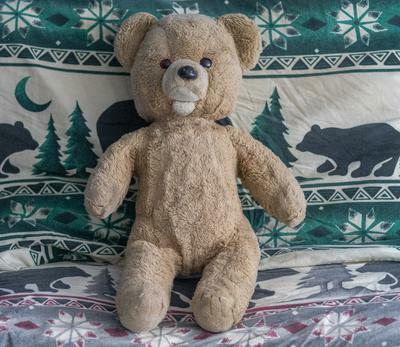 You can imagine that he went to the "teddy bear hospital" quite a few times. But he was so loved. 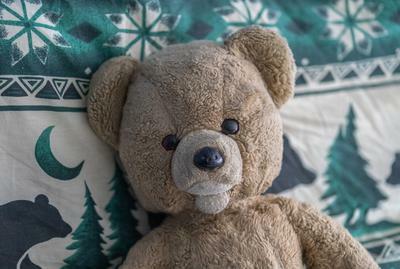 He was the bear that I chose to keep me company at night when I would go to sleep, and he would even be the bear that would come with me on family vacations. He was my best friend, and to some regard, still is to this day. Sometimes I find him to be a very useful friend to hug when tough times come about, and I appreciate that he has that power in him, to make a grown man feel safe and positive. when I knew him. It wasn't until I came across this website (today, actually), and decided to randomly type in the search box "zipper," because that's something that he had. 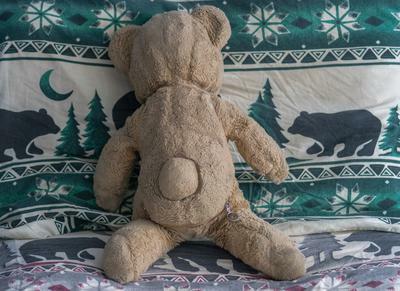 He was the only teddy bear that I knew of who had a zipper on his bottom, that opened up to reveal a pocket. To my absolute surprise, I came across a posting about a bear named Barry, who looked strikingly close to Mishka, and it blew my mind. I looked through the comments, and discovered that he isn't technically an original teddy bear. He is a teddy bear called, "Pete & Repeat And Friend" and that he is made by Mars Toys. I remember even dreaming about Mishka once and discovering a copy of him, and never did I expect to have that dream become a reality. It's astonishing to realize that Mishka has so many "brother/cousins," and that he was originally from 1985 (or about there). I think he was given to my family by a friend or a woman at a store, but he must not have been brand new at the time, because he didn't have any tags. As I see him now compared to what he used to look like, it's amazing to see how used and loved he was in my youth, but I am so grateful that he is still around to this day. I can absolutely understand the sadness that others on here bear when it comes to trying to find out what brands/companies made their childhood friends that may no longer exist. I think teddy bears are just fantastic toys. They don't ask for anything, but they accept all the hugs and love that you can give them, and they can be the best listeners and companions. I remember fantasizing when I was younger that when I pass on, I don't think I could give him up to my children or grandchildren, because he and I had such a bond, and I wanted to either be buried or cremated with him by my side. I don't know if I still have that same mindset, but at times I think it doesn't sound as corny or silly as I sometimes think it might.